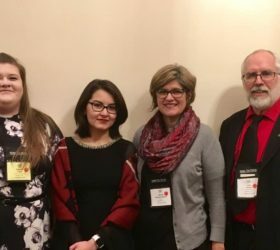 On Mar 21 to 24, Sigma Tau Delta had an International conference in Cincinnati, OH. 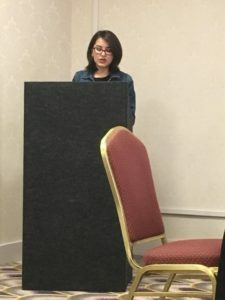 Two of DSU’s Sigma Tau Delta members, Kennedi Ford and Nelofar Sultan, went to Ohio to present papers that they had submitted for the conference, and to visit a few workshops while they were there. One of the main ideas of the workshop was “that you don’t need to look for those journalism or high school English teaching jobs. Every business, in some shape or form, needs someone to write for them and put it out there.” Ford, while already knowing this, was comforted by the fact that this was said by someone who already had a job outside of the traditional English careers. There are currently 10 people in Sigma Tau Delta on campus, a pretty small group, though they are planning on doing an induction toward the end of the year. There are specific requirements to join, such as having an English major or minor, but if someone is interested, they can contact either Kennedi Ford or Dr. John Nelson.